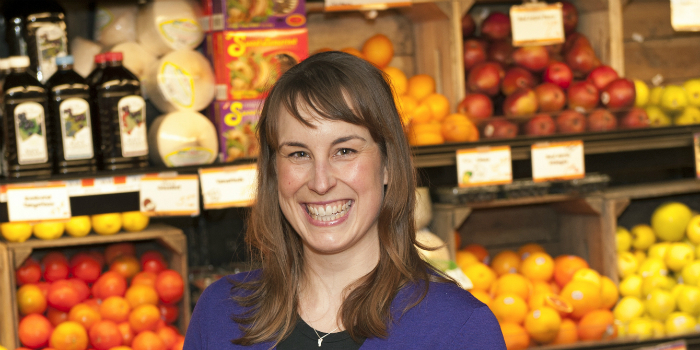 Lizzy Pope is an assistant professor in the UVM Nutrition and Food Sciences Department, as well as the director of the Didactic Program in Dietetics. Lizzy enjoys looking at the thought process behind the food and exercise choices people are making, and then testing ways to impact these decisions with minimal willpower expenditure. Much of Lizzy's time is spent running, swimming, biking, skiing, or doing pretty much any activity presented to her. Pope, L., Garnett, B., Dibble, M. (2017). Engaging adolescents in inform the development of a mobile gaming app to incentivize physical activity. JMIR Research Protocols. In Press. Pope, L., Hansen, D., Harvey, J. (2016). Examining the weight trajectory of college students. Journal of Nutrition Education and Behavior. 49(2). 137-141.e1. doi:10.1016/j.jneb.2016.10.014. Wansink, B., Latimer, L., Pope, L. (2016). “Don’t Eat So Much:” How parent comments relate to female weight satisfaction. Eating and Weight Disorders – Studies on Anorexia, Bulimia, and Obesity. In-Press. doi:10.1007/s40519-016-0292-6. Latimer, L., Pope, L., Wansink, B. (2015). Food Neophiles: Profiling the adventurous eater. Obesity. 23(8): 1577-81. doi: 10.1002/oby.21154. Wansink, B., Pope, L. (2015). When do gain-framed health messages work better than fear appeals? Nutrition Reviews. 73(1). 4-11. doi: h10.1093/nutrit/nuu010. Pope, L., Harvey, J. (2015). The impact of incentives on intrinsic and extrinsic motives for fitness-center attendance in college first-year students. American Journal of Health Promotion, 29(3). 192-9. doi: 10.4278/ajhp.140408-QUAN-135. Pope, L., Hanks, A.S., Just, D., Wansink, B. (2014). New Year’s Res-Illusions: Food shopping in the New Year competes with healthy intentions. PLOS ONE. 9(2). doi: 10.1371/journal.pone.0110561. Pope, L., Harvey, J. (2014). The efficacy of incentives to motivate continued fitness-center attendance in college first-year students: A randomized controlled trial. Journal of American College Health 62(2), 81-90. doi: 10.1080/07448481.2013.847840. Pope, L., Harvey-Berino, J. (2013). Burn and Earn: A randomized controlled trial incentivizing exercise during fall semester for college first-year students. Preventive Medicine, 56(3-4), 197-201. doi: 10/1016/j.ypmed.2012.12.020. Dunn-Carver, M., Pope, L., Dana, G., Dorwaldt, A., Flynn, B., Bunn, J., & Harvey-Berino, J. (2013). Evaluation of a teacher-led physical activity curriculum to increase preschooler physical activity. Open Journal of Preventive Medicine, 3(1), 141-147. doi: 10.4236/ojpm.2013.31018.